I was saddened to hear last week that the veteran boxing trainer Bill Chevalley, perhaps best known for guiding middleweight Mark Rowe to a British and Commonwealth title, had passed away at the age of 87. While it’s perhaps a cliché to say of someone ‘boxing was his life’, this statement is entirely true of Bill, and so I say it here without hesitation. While there are many people who knew Bill far better than I and who are better qualified to write about him (I wasn’t even born when Bill’s well-known protégé Mark Rowe was making headlines), when I heard the news of his passing I felt compelled to pen a small tribute. Bill Chevalley was born in Islington in 1925 and grew up in this London district, which was then a thriving boxing area, close to noteworthy but now forgotten small-hall venues such as the Chalton Ring in Somers Town, Caledonian Road Baths, Hoxton Baths and Shoreditch Town Hall. By age 13 Bill was training and sparring in professional gyms, learning all he could and putting the moves and methods of the pros to good use in his own training and amateur bouts. Bill served in the Navy between the ages of 18 and 24, and it was during this period that he had the bulk of his amateur bouts, the total of which he said was around 180, which was more than enough, as he put it, ‘to learn the business’. After the war, Bill had several approaches from managers who wanted him to turn professional, but he told me none of the offers suited him or seemed worthwhile. And so, as he was already earning good money via a steady job, he turned them all down. Instead, he hired his services out as a sparring partner to professional fighters and travelled the gyms of London, earning cash in his spare time. That, of course, was during Allen’s heyday in the late 1940s and early 50s, and there were many other pros of that era who engaged Bill as a regular sparring partner, among them Bill’s friend (and fellow Islington man) Jackie Lucraft, who tragically died in an accident at age 29. Later – quite by chance – Bill started training fighters. He was working off weight in a gym when amateur boxer Dave Crockford asked him for advice. Bill took charge of Crockford’s training on a private basis and helped mould him into a first-class junior. It was evident then that Bill had a talent for imparting his considerable boxing knowledge to others. Afterwards he became an instructor at the Covent Garden Club and then the Fitzroy Lodge, working with good-class fighters such as Dennis Pollard, Tony Burns, Allan Brooks, Johnny Cheshire and the brilliant Nicky Gargano (Olympic bronze medallist in Melbourne, 1956, and three times ABA welterweight champion). Bill left the amateurs because, as he put it, he became ‘disillusioned with all the back-biting and petty rivalries’ that he felt were creeping into the sport. He then became a prominent figure in British professional boxing through his role in the success of Mark Rowe. Bill had taken over Mark’s training when Mark joined the Fitzroy Lodge Club at age 13. With Bill as his coach, Rowe captured two junior ABA titles and as a senior won the 1966 Empire and Commonwealth Games (now the Commonwealth Games) light-middleweight gold medal. After winning his gold medal, Rowe wanted to turn pro, but initially Bill tried to dissuade him as he was well-off financially, his family owning a profitable pig farm. But when Rowe insisted on joining the paid ranks, Bill worked with him ‘to get the boy the best possible deal’. This turned out to be an £8,000 signing-on fee from manager Johnny Arrow – a munificent sum for signing as a pro in those days. Before long Johnny Arrow left boxing and Mark continued his career as a self-managed fighter, but with Bill as his trainer and sage. Theirs was a relationship based on trust and there was no written agreement between them. To cut a long story short, hard-hitting Mark became famous as one of Britain’s most exciting pros of the late 60s and early 70s and won the British and Commonwealth middleweight crown from Les McAteer in 1970. The full story of Mark’s career (including his association with Bill) is retold vividly in Melanie Lloyd’s book Sweet Fighting Man Volume II. Bill was naturally proud of his connection with Mark Rowe, but was quick to point out that he did plenty of other things in boxing. I was introduced to Bill in 2007 at a London Ex-Boxers Association (LEBA) meeting, where I had gone in the hope of meeting people who knew my grandfather, pre-war ‘boy wonder’ boxer and respected post-war trainer Nipper Pat Daly. Bill, it turned out, had known my grandfather well in the 1940s and 50s, spoke very highly of him and had sometimes trained at his gym in New North Road, Shoreditch. 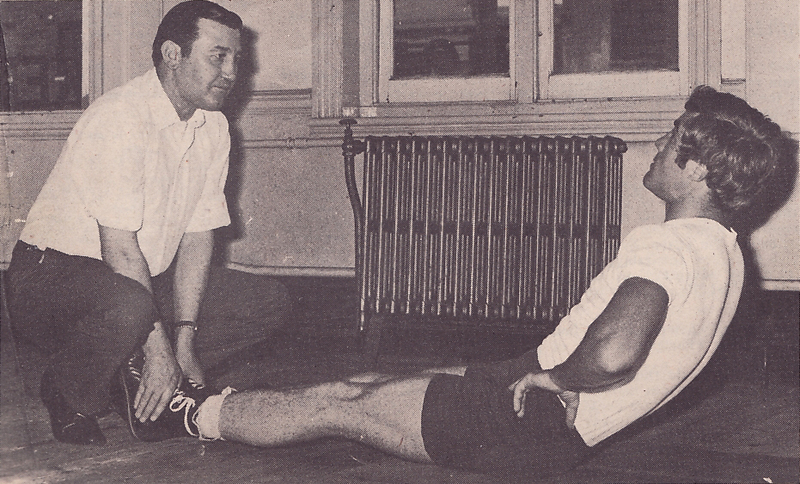 Bill recalled, in particular, using the gym for a week when helping Jackie Lucraft prepare for a big fight. Several very long and very interesting chats with Bill followed, both on the phone and at LEBA meetings. I soon discovered that if you wanted to know about a London boxing gym of the late 1930s or later, then Bill was the man to see. Chances were he’d worked out there and would have a story or two to tell. A union steward at the Standard, Bill was a man with strong principles and firm views that he wasn’t afraid to air. At times this put him at odds with the boxing authorities, but Bill didn’t mind and would readily suffer their disapproval in order to do things in what he keenly felt was the right way. When I asked him how modern boxing compared with the fight game of his youth, his reply was characteristically frank. Bill explained to me that some of the best moves and methods of the old-time fighters had died out and were no longer seen today. As we stood at the bar of an Old Street pub – just around the corner from Bill’s home on Golden Lane – he showed me some of the moves and tricks he was talking about. Subtle yet effective, they involved maneuvering an opponent into positions that left him open to an attack. When I met Bill he was slimmer and grayer than in the photo above, and having boxed from flyweight to featherweight, he certainly wasn’t tall. But he had a warm, vibrant personality, a friendly demeanor and old-fashioned good manners. The thing that struck me most about him, however, was his dapper appearance. Always immaculately turned out in a dark suit, gleaming white shirt and carefully knotted tie, Bill looked sharper and smarter than any octogenarian I’ve ever met. I regret losing touch with Bill Chevalley and that I didn’t take the time to record more of his reminiscences. I’ve been told by people who’d known him for years that countless young men were steered away from a life of crime and instead taught discipline, manners and respect for others by this fine man, who on occasion – when needed – would put a roof over their heads. I hope that this small tribute goes some way to acknowledging his contribution to the sport he loved and served so well. 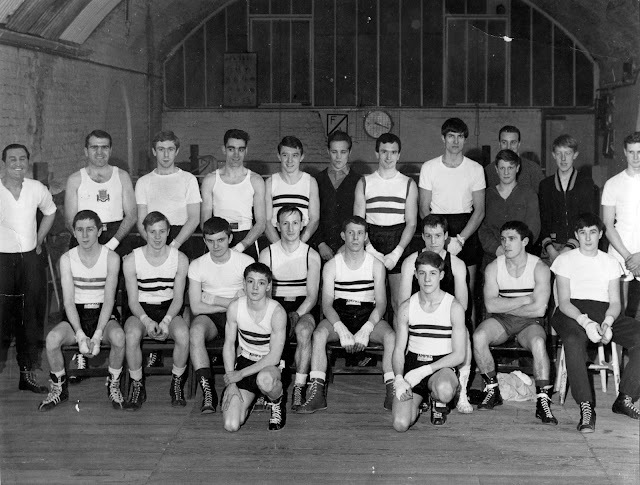 Bill Chevalley with his Fitzroy Lodge ABC team. 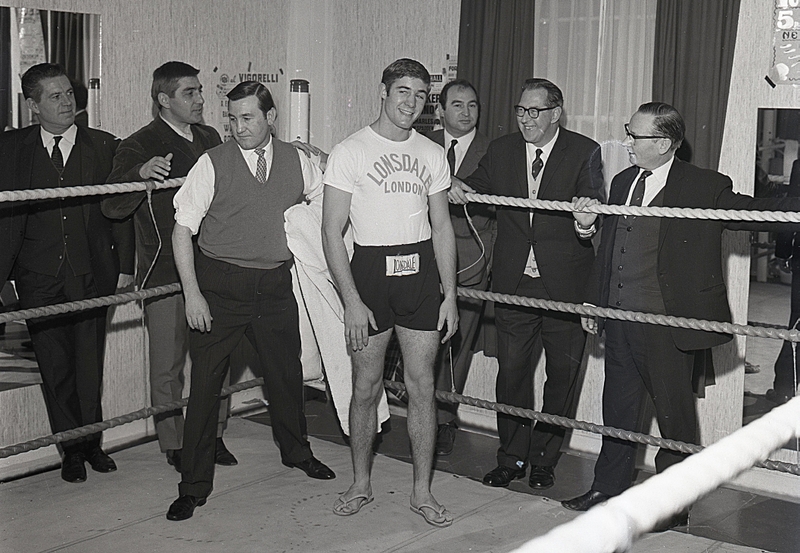 Among the boxers pictured are Larry O'Connell, Mark Rowe and Tony Burns. In the ring: Bill Chevalley and Mark Rowe. Outside the ropes, left to right: John Parry (Bermondsey promoter and bookmaker), Johnny Arrow (then Rowe's manager), Freddie Foreman and Ron Olver and Tim Reilly of Boxing News. Image © Derek Rowe. had the highest respect for Billy. What do you know about best bookmaker for hockey ??? I hope you have plenty of varieties. Please don't hide you experiance. It's very important for my business. I can even pay ypu money.